Where it all starts: the ticket booth. Festival filled screenings to overflowing from Thursday to Sunday. Aretha Franklin finally made it to the Vineyard. The Queen of Soul had booked a Martha’s Vineyard performance in 2017, but the tour was canceled and ill health took her life last summer. But in the concert documentary Amazing Grace, which played the Martha’s Vineyard Film Festival on Sunday, Island audiences witnessed the singer in a way they never could have in a summer concert here. Warner Bros. commissioned filmmaker Sidney Pollack to capture Ms. Franklin’s January, 1972 recording session for what would become the best-selling gospel album of all time. But the documentary was plagued with technical difficulties and Ms. Franklin opposed its release until the end of her life. It’s easy to see why. Filming in a Baptist church with a live audience, Mr. Pollack’s cameramen can’t seem to stay out of each other’s shots. Again and again, one equipment-laden, underdressed white man or another lumbers through the picture, which often distracts from the music. Ms. Franklin herself seldom smiles, perspiring heavily throughout her performances. At one point her father, Rev. C.L. Franklin, comes forward to tenderly, but thoroughly, mop her brow, face and neck as she plays the piano and sings. But the music lifts fans high above such earthly considerations. This is Aretha Franklin at the pinnacle of her secular greatness, with 11 consecutive number one singles, returning to the church. Even the gospel star Clara Ward comes to sit at her feet, while Mick Jagger and Charlie Watts watch in amazement from the back of the room. Amazing Grace closed the festival which began on Thursday and screened 30 movies, including shorts. Music was a frequent theme, recurring in the documentaries A Tuba to Cuba, Satan and Adam and the feature Rose Marie. Satan and Adam traces the rise of an unexpected duo in the 1990s: street musician Sterling “Mr. Satan” Magee and Ivy League intellectual Adam Gussow, whose love of blues harmonica and Mr. Satan’s guitar playing was stronger than his fear of going to all-black Harlem during times of racial tension. Beginning on the street, the two musicians developed an act that would take them into recording studios and on the road, ultimately playing the New Orleans Jazz & Heritage Festival—a career-making date. But one day Mr. Satan—an original thinker along the lines of Sun Ra, the jazz bandleader who believed he came from outer space—disappeared, leaving Mr. Gussow without his friend, his act and his musical career. What happened next took the filmmakers more than 20 years to explain, with twist after twist keeping the audience alert. The music footage, dating back to the early 1990s, is raw, energetic and compelling. The story is one that more people should know. 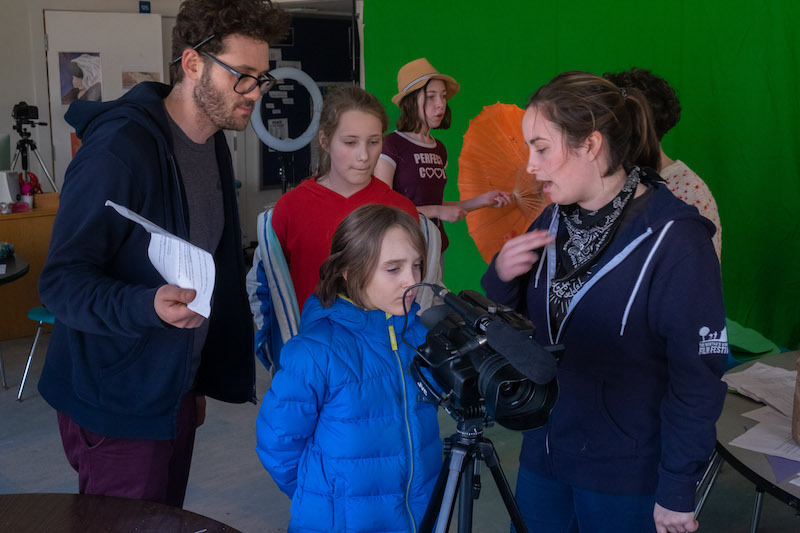 This year’s festival line-up also included experimental theatre, live music, kids’ movie-making workshops and a Shakespeare talk. 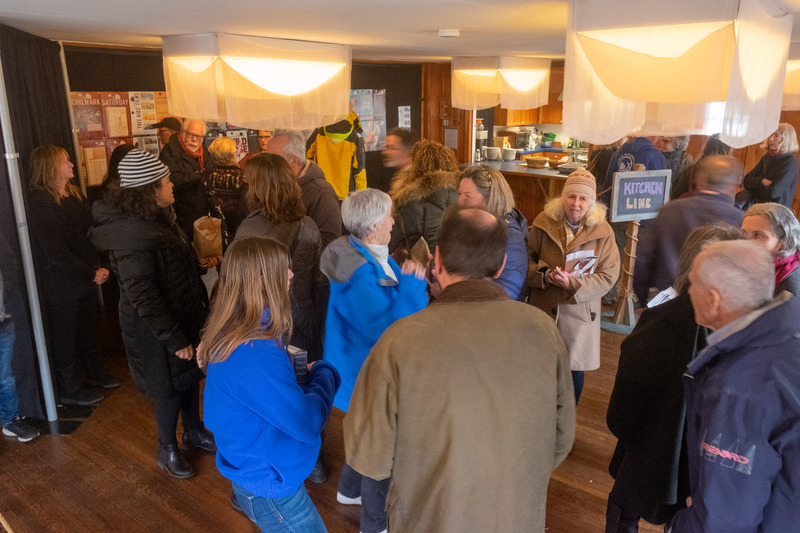 “We’ve always said we’re more than movies,” artistic director Brian Ditchfield told an audience of about 50 people who turned out Sunday afternoon at Pathways for a live event called Understanding Hamlet. Four actors—Mr. Ditchfield and his wife Brooke Hardman Ditchfield, Scott Barrow and Chelsea McCarthy—performed key moments of the play in between brief interviews with eminent theatre critic and director Robert Brustein. For those who missed Mr. Barrow as Hamlet at the Tisbury Amphitheater last summer, directed by Ms. Ditchfield and Ms. McCarthy, it was an unexpected treasure to experience his sensitive interpretation of the character. Understanding Hamlet was the lead-in for a screening of the feature Ophelia. As reimagined by novelist Lisa Klein and director Claire McCarthy, this Ophelia is no mere foil to Hamlet’s melancholy. We know this before the movie even starts because Ophelia is played by Daisy Ridley. An international star for her role as Rey in the Star Wars sequel trilogy, Ms. Ridley’s Ophelia doesn’t go mad—she gets even. Ms. Klein and Ms. McCarthy’s feminist retelling of the play is set in a sprawling hilltop castle—Gormenghast comes to mind—with medieval interiors, costumes and props enough to satisfy the bloodiest-minded Game of Thrones fans. Ophelia does not have an American release date yet, but is worth watching for when it comes around. Other new films the festival brought to Islanders’ attention included Olympia, an in-depth profile of the actress Olympia Dukakis that was followed by a Skype conversation with the 87-year-old Academy Award winner. Along with new films and live interviews with directors and stars, the film festival served lunches and dinners prepared by Morning Glory Farm chef Robert Lionette. 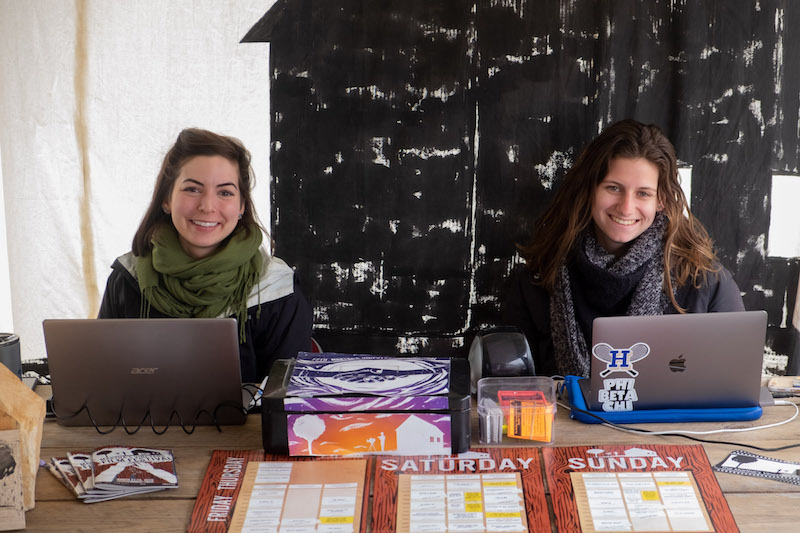 No ticket was required to buy a meal or to hang out in the festival’s Hay Café, a snug tent furnished with rustic, communal tables and benches and hay bales for extra seating. 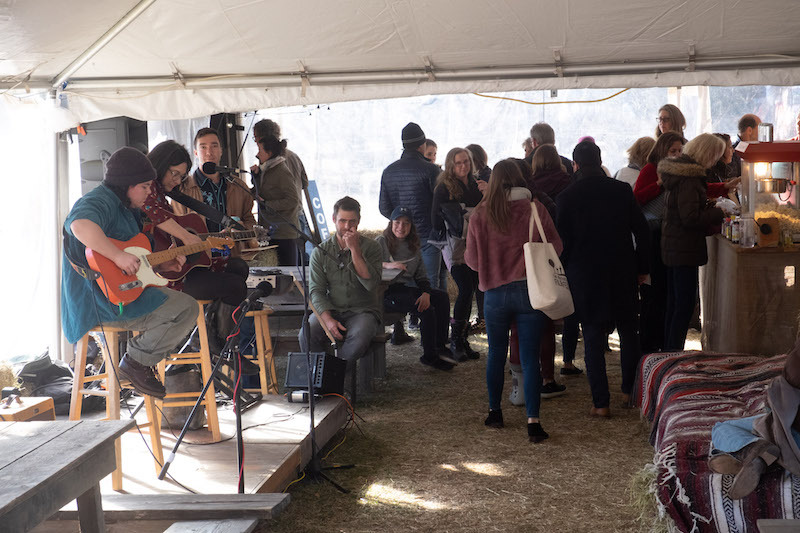 Not only was the café the center of activity on the festival’s temporary campus, which included the Chilmark School and Pathways as well as the community center—it was probably the liveliest place up-Island all weekend long. Local performers including Andy Herr, who took over booking festival music this year, played blues and folk music on a small stage in the café as people ate, chatted and listened. Kids climbed on the hay bales and artist Barney Zeitz sat sketching the scene. Next year the festival marks its 20th anniversary. Founder Thomas Bena said he continues to explore building a permanent campus for the organization. “We’re getting bigger every year,” he said.